Confessional: towards the end of summer in 2016, Andy and myself whizzed over the bridge into Claydon and up the Old Ipswich Road. Up here, the driver reassured me, is a little volunteer run cafe called The View. We parked in the business centre and looked for a sign. Of which there was no sign. Can I help you? said a lady sticking her head out of a nearby door. Ah, she said. The Suffolk Family Carers View Cafe closed last year. Thus we ended up sitting on the village bench eating takeaway bakery goodies. CHBW, TBH. My turn, this time, to propose a trip thataway. Says it's open today on Facebook, I said. 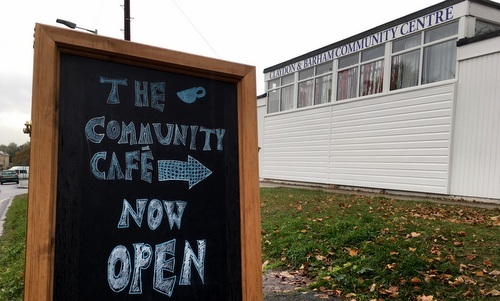 Sure enough, well placed signs pointed us to the Claydon Community Cafe up on Church Lane. No parking for the cafe by the school, said another sign. Doesn't matter, I said, we'll take a chance. Walking away from the car, we saw another sign: please no parking for the cafe, it pleaded. Andy, go move the car. In a side door out of the rain and most tables are already occupied. Great to find the locals using it and not losing it. Serving area is to the side. Anything hot and savoury? The nice lady behind the counter had us at "bacon sandwich". Sat down, hooked up to the WiFi, supped a vanilla Yazoo, flicked through some old magazines, and out came our meaty sarnies. Met with full approval from both of us, Andy in particular very taken with the way they'd grilled those slices of back. Continuing our community service, we invested more small change into shared slabs of rocky road and banana cake. Yum, esp. since the good folks at the CCC have only gone and purchased a top quality coffee machine. Don't think she was there on our visit but top work by Barham lady Jill Shipp for setting it up. If it was a car -- Ford Kuga from Claydon Autos. If they were passing by -- Bodie Olmos.